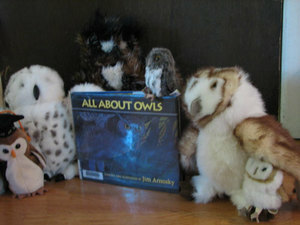 A creative way to do an oral narration of a book is through a dramatic production or puppet show. 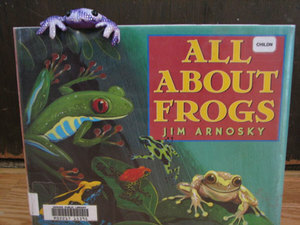 Jim Arnosky's books lend themselves well to a presentation by stuffed animals or puppets. 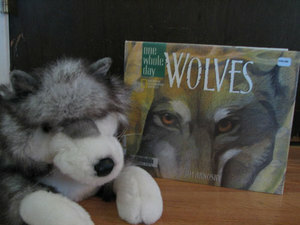 We have quite a collection of animal puppets and other stuffed animals so this was a natural choice. 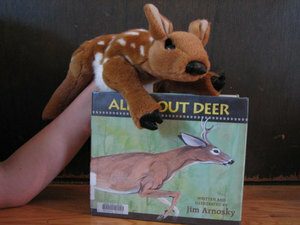 Even without actual animal puppets or stuffed animals, children could pretend to be the animals or paper animal puppets could be made (ala Crinkleroot) or use animal figurines for a mini show. 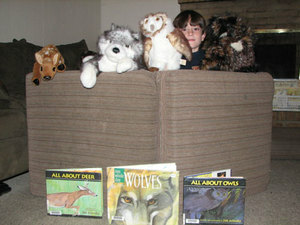 After reading a book, the child(ren) can present the information and facts about that animal as a show acted out by the animal being featured in the book. 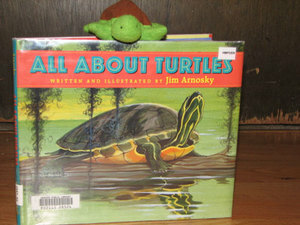 This works well with the "All About" or "One Whole Day" books. 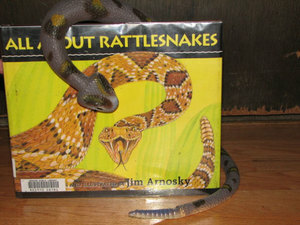 With other Arnosky picture books that tell more of a story, such as Every Autumn Comes the Bear or Coyote Raid in Cactus Canyon the show could be a re-enactment of the storyline.